Is it hard to get your kids to practice? Do they complain and whine, do they want to quit? You are not alone. 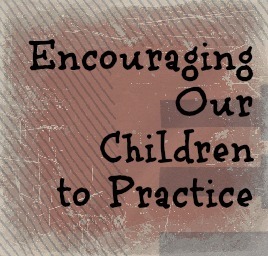 Getting our kids to practice can bring major stress, arguments and contention into our homes. The first thing to remember is that practicing does more for our children than just make them better on the piano, or at soccer. Practicing teaches our children valuable life skills. We need these qualities throughout our lives. Long after the soccer games and piano practice have ended. Given that most of us are probably dealing with this on a daily basis, let's talk about some of the commonly asked questions when it comes to our kids and practicing. Getting our kids to practice can be really frustrating. For parents there can be a fine line between encouraging and pushing too hard. Can parents push too hard? Yes, if we are pushing because we have our own agenda. Then we are pushing too hard. If we are pushing and our kids are miserable and not having any fun, then we are pushing too hard. Realize that if we are going to push our kids, then we need to be willing to be more creative to help our children enjoy the practice and activity. What about bribes. Is it ever okay to bribe? Instead of "I will buy you a new toy if you practice the violin", we want our kids to practice the violin because it is the good and right thing to do. Because they are learning a valuable talent and fulfilling commitments to themselves and their teacher, and to us as parents. To do this, focus on rewards and incentives, instead of bribes. don't talk about the gift or treat before, but instead present it AFTER practicing has been done. don't reward for every practice. focus on setting goals and once they are met, celebrate. These can be daily, weekly, or monthly depending on what your child needs. What do we do when our kids want to quit? When our kids want to quit, don't immediately let them throw in the towel. Understand that kids usually want to quit because there is a problem. Try to identify why your child is unhappy in the activity. Could the activity be too hard, could it be that they don't feel like they have any friends on the team, are they over-scheduled, or maybe they don't like the teacher/coach, or would rather do other things. Then, ask key questions to gather information.. I thought you liked soccer, what has changed? What part of baseball are you struggling with? What solution do you think would make you enjoy piano again? Remember to BE PRESENT. Whether it is soccer or piano, Attend practice whenever possible. You will learn a lot about their true feelings. Often times just attending practices will fix the problem. Kids don't like being "sent off" to practice. Even with piano. You don't have to sit at the piano with them, but sit in the same room when they practice. You can read, get on the computer, etc... Comment every now and again on what they are doing. It really does make a difference with practicing. We can't always attend everything. Especially when we have more than one child, or work, but we can do our best to be at practices whenever possible. We learned this with our son. He was fighting against piano practice. So, instead of sending him to the piano to practice alone while I made dinner in the kitchen, I sat in the same room with him. It made a huge difference. We also changed to practicing in the morning instead of after school when he was tired. Within a week, the whining and crying stopped. Lots of time our kids will complain about going to practice, but once they get there they love it and come home and talk about it for the next two hours. This is a pretty good sign that they DON'T need to quit, but address a problem instead. We went through this with our daughter. She complained on the way to dance every week. Tears and all, but she would always bounce out of dance, so happy she went, already talking about the next week. And then she would come home and practice dancing in the kitchen all night. I knew she loved dance and didn't need to quit, but why all the complaining? I asked her what we could do so she would enjoy dance again. She said she needed a break after school. I was picking her up from school and immediately taking her to dance on Tuesdays. As a 6 year old, going from a full day of school, to dance was too much. She didn't really want to quit, we just needed to find a way for her to unwind in between. I made some changes so when I picked her up, even though we were still in a hurry, she could relax. I was having her change her clothes in the car first. I switched and let her eat a snack, drink, ...first... and instead of snacking and eating in the car while driving, we ate on the grass and she changed in the school bathroom. It changed everything. These small changes stopped the complaining. 1. It is okay to have them finish out what they have committed to. Finish out the season etc... This teaches them to follow through on their commitments and if it is a team activity, that they have a responsibility to other people. It will give children a sense of accomplishment also. 2. Find something else that better fits their interest and personality. Don't loose sight of the big picture. We are helping our children develop life skills. Skills they need forever. These skills are bigger than if they sat at the piano for 20 minutes or 30 minutes. Plus, they are making memories. Do we want their memories to be filled with arguing and stress, or positive experiences and fun? Getting our children to practice can be difficult and stressful. But, if we will work to make it fun and be open to our children's thoughts and feelings, we can solve the problems and know when to let them stop, and when to help them push through. Do your kids complain about practicing? Do you believe in making your kids finish what they start? This is exactly what I need right now! Thank you!!! I hated practicing as a kid but I loooove playing the piano as an adult, so there you have it. I recently read Battle Hymn of the Tiger Mother for my book club and I have to say, while I disliked pretty much every aspect of her mothering, I did like that her daughters love to play the piano or violin, even after their mother screamed in their faces for 8 hours a day to practice. Oh! Something else I wanted to say. My 8-year-old has tried every sport our tiny town will offer (baseball, tennis, soccer) and hates them all. We made him finish each season because he committed to it, but he doesn't want to do it again. There are no other choices here, so now what? We want him to stay active, but he doesn't have to love sports...I just don't know what to do for him. Emily, what about running? Many towns have running clubs and post calendars with races. Lots of 5k races have kids' fun runs. When I took up running, my kids got excited about the races too. Their school also has a walking program in the morning 4 days a week. They walk laps in the gym. 20 make a mile. It's staffed by parents and at the end of the year the kids are recognized. Last year my boys walked 140 and 103 miles. It was fun! Love the reminders about what kids learn besides practice when they practice.